China is in fact exporting capital on a massive scale globally and in Pakistan its presence is felt everywhere. It is seen as an imperialist power which is encroaching on US influence in the region. Serious bourgeois commentators are saying that China should play a role in stabilizing Afghanistan as the US can no longer play the role it did in the past. Part of this is to prepare to withdraw from Afghanistan, but this can only come about if China is prepared to take over the policing of the region. We are in a transitional stage where the US has been weakened but China is not yet ready to take over. There is no contradiction between the fact that in the Pacific the US is in conflict with China, while in Central Asia it requires its help! All this is part of the analysis of the relative, long term, historical decline of the United States as a world power. The process has been going on for decades, and it was less evident in the past only because of the collapse of the USSR, leaving the US as the sole world superpower. It still remains the number one power, but its weakening explains many conflicts around the world, especially in the Middle East. It is part of the turbulent period we have entered into. There was interest expressed in what is happening in the United States, with questions on the role of Bernie Sanders and whether there any comparison with Corbyn in Britain. There were also questions about the impact of Trump’s policies on the US economy. In fact, it was during the congress that we heard of the news that Trump had announced not only his 45% tariff on imported Chinese goods, but also a 35% tariff on US companies producing abroad. In the discussion it was highlighted that the recent developments with both Bernie Sanders and Trump showed what enormous changes have taken place in the US. On the one hand Sanders revealed what a huge interest there is now in the United States in Socialism. But it was also explained that the kind of Socialism espoused by Sanders is of the reformist type, which means attempting to manage capitalism without overthrowing it. On this road there is no solution to the problems of US workers. The role of Corbyn was also highlighted, explaining that he is a product of the serious crisis afflicting British capitalism and the social conditions that flow from it. It was also explained that he does not pose the need to put an end to capitalism, but that he is seeking solutions within the confines of the system. One comrade asked whether the US pulling out of TPP, the Trans-Pacific Partnership, would lead to reciprocal action by other powers in the region such as Japan. Another asked whether the US would have to go to war to implement the protectionist policies of Trump, and what are the prospects of a Third World War. Although there are growing tensions between the powers and protectionism is on the rise globally, the US is not in a position to impose its will militarily. It is sufficient to look at the situation in Iraq and Syria, to see the weakness of American imperialism. In Iraq they have de facto conceded influence to Iran and in Syria to Russia, which is one of the powers playing a greater regional role due to US weakness. On the prospects of a Third World War, it was pointed out that the class balance of forces globally at this stage rules out world war. Before the ruling classes of the world will be able to resort to a global conflict, the working class in all countries will move over and over again in an attempt to change society. The Second World War was possible only after twenty years of revolution, beginning with the Russian Revolution in 1917 and ending with the Spanish Civil War in 1936-37. We have before us not world war but intensified class struggle. Furthermore, in today’s conditions, with the immense destructive power of modern day weaponry, going to war would not guarantee victory but mutual destruction. The rulers of the major powers will think many times over before venturing on such a disastrous road. That does not exclude many local conflicts, such as the war in Syria, or the wars in Iraq and Afghanistan. We will see growing instability and local wars, where the fundamental contradictions between the major powers will be played out. Interest was shown by more than one comrade in what has happened in Greece, in particular what has happened to the left split from Syriza, Popular Unity, and what the future holds for this party. In the reply it was explained that this party is in a state of collapse, having failed to get any MPs elected to parliament. The reason for this was that it did not raise the socialist programme, but concentrated on calling for a return to the Drachma. It also paid the price for having been in the Syriza-led government and for not really fighting to win the party as the Tsipras leadership betrayed the aspirations of the masses. All the conditions existed for the left wing of Syriza to win a majority. But not having waged that battle in a serious manner, it paid the price in the elections. It was highlighted that if the Left of Syriza had been a Marxist tendency, it could have dramatically changed events. This underlines the urgent need to build the forces of genuine Marxism in all countries and prepare a force capable of having an impact on developments when the objective situation moves towards revolution. Many questions were asked about the nature of the crisis of capitalism worldwide, what led to slumps and falls in profits, and why the capitalists can’t find a solution to the crisis of their system. This was answered by giving a brief outline of the nature of the capitalist economy, the fundamental contradictions, the tendency to overproduction and the accumulation of debt. There is no solution to this crisis if we remain within the confines of the market economy. Some interesting questions were asked about the rise of religion and fundamentalism, and why this was taking place. Another question posed was about why in conditions of such deep crisis there seems to be no response from the workers. Religious fundamentalism has emerged in a situation of crisis of the system and it is due to the lack of a fighting leadership of the working class that such phenomena can appear. The masses seek answers to their pressing problems, with unemployment and poverty growing everywhere. The leaders of the Left and the trade unions have no answers to this crisis and, in the vacuum they leave behind, reactionary forces can step in. But at the same time we are seeing the workers and youth looking for a way out on the left. This explains Sanders in the US, Corbyn in Britain, Podemos in Spain, Melenchon in France and other similar phenomena on the left. They represent a striving for a socialist solution to the present crisis. And on the question of the lack of working class response to the austerity being imposed, it was explained that for the workers to come out and fight they must feel confident that struggle pays. The experience of Greece was used to highlight the real situation. The working class did fight and mobilised massively. There have been around 40 general strikes since the beginning of this crisis, but general strikes alone do not change society; they merely pose the question of the need to change, and make it clear to all that the workers are prepared to fight. However, if the trade union leaders limit themselves to periodic strikes with no perspective of moving onto the political front, the movement can be lost. But the Greek workers did go beyond the trade union struggle and took a political step, abandoning the PASOK and catapulting Syriza into government. Again, they were betrayed. If in such circumstances there is no organized Marxist left opposition, then the movement can unravel and frustration, confusion and even demoralization can grip the working class for a period. All this poses the urgent need to build the forces of genuine Marxism long before the events erupt. There is no time to waste. After the lunch break on the first day, the congress resumed with a lead off by comrade Adam Pal on the perspectives for Pakistan. The comrades had received the Pakistan Perspectives document prior to the congress. Adam explained after the split in The Struggle in March that there had been much discussion among the comrades on perspectives. There has been a clear change in the world and in Pakistan. We are living in a new era now. The situation today is very different from that of 20 or 30 years ago. The events unfolding are no accident. Look at what is happening in S. Korea where we see one million people protesting on the streets, or in South Africa where we have seen a marvellous movement of the students, and many other movements around the world. Why are we seeing this sudden change? There has been a radical transformation of the situation in society, with immense political upheaval everywhere. We must therefore discuss the perspectives facing us and how we prepare to intervene. In Pakistan we have a total collapse of the already miserable healthcare facilities; we live with constant terrorist attacks, and so on. What is the future of the country? Will it be like Libya or what? We see the impotence of the United States, while in Pakistan all the politicians and businessmen are praising China and its role in the region. How does China’s spreading influence affect Pakistan? China has come into Pakistan and is buying up everything. They claim Chinese investment will reduce poverty in the country. But this is false; just look at the big highway that has been built: on either side of that road, poverty still prevails. The US is retreating from the region, but China, in spite of its growing influence, is not strong enough to replace it. In the past, the present conditions would have led to the imposition of Martial Law as happened under the dictator, General Zia. That is not possible today, with the present balance of class forces. What we have is a divided ruling class, with one wing seeking Chinese investment, while another looks to the United States, and some even look to Turkey. At the same time, we see a seething anger and hatred towards the ruling class among the mass of workers, peasants and poor. They are disgusted by the circus of the political scenario. This is accompanied by movements and strikes of workers, from the PIA strike earlier this year to the movement of the nurses. The workers are beginning to flex their muscles, but there is no party that can give an expression to this. Imran Khan’s party has failed, as has also the PPP. The relationship between the PPP and the masses has changed. The working class no longer trusts the PPP. The media are trying to depict the PPP as “reviving”, but the leaders of the party continue with their policy of supporting privatization of practically everything. The working class is going to move in a big way and we will see both shifts to the right and to the left in the coming period. The problem is that there is no party that can provide a channel for the workers to express themselves through. Meanwhile, Kashmir is being crushed by the Indian Army on one side, while the Pakistan state promotes Islamic fundamentalism in the area as a means of crushing the growing revolt. None of this, however, is having the desired effect. The people feel they are like refugees in their own country. Big protests continue, with demonstrations of up to 200,000. It is now four months since the protests began and still they continue. Thousands have been injured and over one hundred have been killed, and yet the movement continues and is getting stronger. The movement in Kashmir is confirmation of the changed conditions and we need to take account of the new elements in the objective situation. This is one of the questions at the heart of the differences that developed within The Struggle. Now if there are no movements it is considered abnormal. Movement is the new norm. The movement in Indian-occupied Kashmir is unique. The Indian government thought that this was the usual eruption of protests that would soon die down, especially with the onset of winter. Instead it has continued, even though there is no party actually leading the movement. We see the anger of the students. The state has imposed draconian conditions on the campuses, with the ban on student unions in place now for decades and the requirement to produce ID to go in and out of the campuses. This is clearly designed to stifle debate and attempts to organise among the students. The question is the same as with the workers: which parties will the youth turn to? The answer at this stage is none! The PIA strike was an indication of the changing mood, but when we posed the need to go to the PIA workers we were told by the leaders of The Struggle that we should not go, and they played down the movement that was taking place. To their surprise the strike lasted for eight days. And in spite of a big police presence, it not only continued but it also attracted the spontaneous support of the railway workers who were threatening to come out in support. The tragedy was that the trade union leaders did not provide the necessary lead and eventually the strike was lost. In spite of the pressures of the The Struggle leaders, we went to the PIA workers and intervened. The situation faced by the workers in Pakistan is highlighted by what happened to the ship breakers in Gadani [See ]. There is the ongoing army repression in Baluchistan, while a whole spate of strikes has broken out in Quetta. The situation has radically changed and workers are entering into struggle while the youth is also radicalized. This explains why the independent youth work is proving so successful, as the big launch of the Progressive Youth Alliance last year proved. In such a situation, we must avoid routinism and wake up to the real concrete possibilities to build the organization. Comrade Faras from Karachi intervened to explain that although the new organisation, Lal Salaam is numerically weaker, politically it has emerged much stronger. He explained how in Karachi they are witnessing infighting between different wings of the ruling state, expressed in conflicts within the state apparatus itself. In Karachi, the MQM, a longstanding fascist type party, which used to have a significant mass base, has lost the influence it had. Ten or fifteen years ago it could organise rallies of 40-50,000, but now it can barely muster a couple of thousand. The MQM mayor of Karachi was openly abused by the masses at a recent rally. In the past the MQM used violent methods, as they were confident of mass support among a layer of the population. Now they are attempting to present themselves as a more “peaceful”, non-violent force. This collapse in the authority of the MQM affects all parties. Imran Khan can no longer mobilise in Karachi. The city used to be a bastion of PPP support, but now that has gone and the party’s authority has collapsed. The masses despise all the parties, including the PPP and see them as being all the same. So when the masses move, it will be very different from the past. Comrade Khalid Jamali from Dadu in the Interior Sindh explained that the PPP has ruled in his region for the past nine years. Now, however, the crisis has worsened with a serious deterioration in the living conditions of the masses. The military continue to loot, confiscating agricultural land and using it to enrich themselves. In these conditions, the masses hate the PPP. Comrade Yasir Irshad from Bahawalpur intervened to comment on OPEC’s decision to cut back oil production, explaining that the price would hover around $50-60, and that there is no prospect now of economic growth. He said that China was out to capture markets in Pakistan, Iran and other countries in the region. Pakistan’s debt has reached the level of $74billion, and with CPEC it is destined to get worse. We are seeing movements of the small and medium peasants in these conditions. And the old political forms have broken down, but the new are yet to emerge. 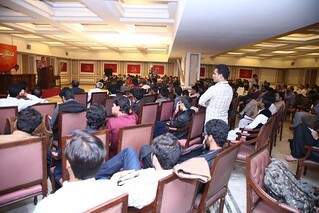 Comrade Ahmar from Islamabad explained that no party is addressing the issues facing the masses. None of the parties are offering any concrete proposals to solve their problems. Now we are seeing the middle layers beginning to mobilise, such as the teachers and government workers. These are fertile conditions for building the forces of Marxism. Comrade Nasira from Gujranwala described the situation facing women, which has now become a living hell for many. Comrade Sadiq from Pushtoonkwha explained how now we just have “money politics”. He highlighted the plight of the Afghan refugees that are just being exploited as cheap labour. He also outlined how nationalist politics was dying. He said that the Afghan-Pakistan border divides the same peoples and therefore the revolution in these two countries will be one process. Adam Pal then concluded the discussion on Pakistan Perspectives. He touched on the Baluchistan National Question, explaining that we support the right of self-determination, but in the given context, this needs to be linked to the class struggle if it is to succeed. He returned to the question of China’s growing influence, reiterating the point that US influence has been weakened and this has given China more room to manoeuvre in the region, but it is still not strong enough to replace the US completely. He explained that security for the CPEC corridor with 10,000 Pakistani troops had to be paid by Pakistan and this would add to the burden on the state’s spending. Pakistan has yet to pay off its old loans and it is taking on new ones. Meanwhile remittances from Pakistani workers abroad are falling. This year there was a 38% year-on-year fall. Due to the nature of the Pakistani economy, most taxation is indirect, while direct taxation falls on the shoulders of the middle layers and not the corporations. The currency is constantly devaluing, and as they attempt a so-called “controlled devaluation” it could spiral out of control and we could see at some stage hyperinflation s we have seen in Zimbabwe. While all this is going on, we see the circus of the media attempting to promote the various bourgeois parties. It actually reveals the fact that none of the traditional parties have any real support among the masses. Elections are a farce, with votes literally being bought. He outlined the growing tensions between Pakistan and India over Kashmir, but also over Afghanistan and Baluchistan where the Indian authorities are providing support to some of the nationalist forces. This could lead to local skirmishes between Indian and Pakistan forces. This highlights the growing instability in the region. The solution lies in the movement of the working class. At the moment we are seeing economic struggles, but sooner or later this will have to find a political expression. Pressure is building up from below and it could lead to an eruption of movements, both of the worker and the youth. It is the growing realization on the part of the ruling class that something is brewing within the working class, that explains their attempts to promote Islamic fundamentalism to divide the workers. This is the new period we have entered and we must prepare our forces to intervene.